One of the great benefits of analysing character through film is it gives teachers a unique opportunity to get past the outward appearance of the character and to start looking at their emotional state. The Axis Of Emotion gives pupils an opportunity to plot the emotional journey of a character through a short film or scene. 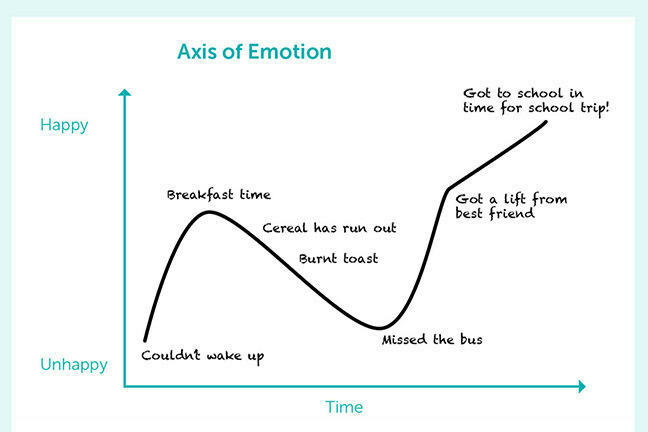 The axis is a graph with time along the X axis and unhappiness up to happiness charted along the Y axis. You can of course label the graph according to what you wish to measure eg anger, frustration, tension etc. You can add different characters to the same graph allowing your class to analyse whether there are links between two contrasting characters’ emotional states at certain times. This also gives the teacher the opportunity to plot interesting parts of the film to analyse. Download the Axis of Emotion template below and try plotting at least one character’s emotional journey through the short films in steps 1.12 and 1.13.